Any hope that the Los Angeles Dodgers would support their pitching with great fundamentals and an underrated offense took an early uppercut to the jaw on Opening Day, 2011. But any fear that Clayton Kershaw wasn’t up to carrying the responsibility of team leader on his shoulders was KO’d. In the latest of his coming-of-age performances, Kershaw shut out the San Francisco Giants for seven innings, striking out nine, and the Dodgers knocked the Giants off their Opening Day beanstalk, 2-1. Kershaw struck out four in the first two innings, eight in the first four innings. He didn’t fret when he went 3-0 for the only time of the night to Pat Burrell, nabbing him two pitches later on a flyout, nor did he get shy after Aubrey Huff hit the night’s biggest shot, a fly ball to the wall in right field in the fourth. Kershaw simply reared back and struck out Buster Posey and Burrell. He pitched out of his first two-on jam in the fifth inning, drew a double-play grounder after allowing a leadoff single in the sixth. In the seventh inning, he matched a Dodgers Opening Day record (for non-extra-inning games – thanks, Bob Timmermann) by striking out his ninth batter. And after that, admired as Hong-Chih Kuo and embattled Jonathan Broxton — after a skipped heartbeat or two — held up their end of the pitching deal, closing out the game. It was a true showcase for the ace — not so much at first for some other of the Dodgers’ skills. 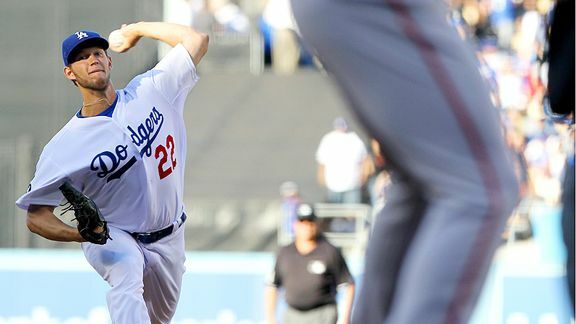 The first inning set the tone, when Kershaw struck out the side to overcome Rafael Furcal’s one-out unforced throwing error. In the second inning, Kershaw was unable to handle James Loney’s lob for a 3-1 groundout, and in the bottom of the frame, Juan Uribe overslid second base and was called out after initially appearing safe stretching a single to a double. Then, after Rod Barajas singled (a hit that might have scored Uribe) and went to second base on a passed ball, Jamey Carroll couldn’t put the ball in play, striking out ahead of Kershaw doing the same. Loney undermined his own Mr. RBI marketing campaign by grounding out with two runners on and two out in each of his first two at-bats — the Dodgers going 0 for their first five at-bats with runners in scoring position. Hey, it happen. And it figures to happen pretty often with the Dodgers this year, not due to a lack of heart but the law of low on-base percentages. Of course, there was also a guy named Tim Lincecum out there on the mound, so no one’s really going to hold the Dodgers too accountable for not lighting up the scoreboard this time around. And then, as it turned out, last year’s world champions proved even more fundamental-free than the Dodgers. After Matt Kemp walked for the second of three, count ’em, three times in the game, Loney nearly hit into another groundout, only to be saved by a Miguel Tejada throwing error. Lincecum then hit Juan Uribe with a pitch to load the bases. And then, in the first bizarre play of this young season, Posey shoveled up a pitch in the dirt, then fired at third base trying to pick off Kemp just as the Dodger was completing his return to the third-base bag. The throw got past Pablo Sandoval, and Kemp trotted home with Run No. 1. Kershaw threw 13 pitches in the seventh inning, giving him 96 for the night and setting up the possibility that with a quick eighth inning, he might go the distance — and spare everyone the edginess of a Broxton appearance. But debut Dodgers manager Don Mattingly gunslinged straight to his bullpen to start the eighth, beginning with Kuo. That’s the guy who elicits no scorn, but Kuo threw his first six pitches out of the strike zone (four to leadoff man Mark DeRosa, batting for Lincecum). Rallying, he retired Andres Torres, Freddy Sanchez and Huff to wrap up the frame. In the bottom of the eighth, Kemp worked out that career-high third walk, followed by a no-contest stolen base. Loney, grateful for the latest chance to drive in a run, came through with a solid double. Neither Uribe, Barajas or Carroll could build upon that Farmer’s Insurance Run (naming rights pending) …and so we came to the heavyweight bout of the night. vs. Posey: ball a little high, and then a grounder to Loney that he slid for, kept in front and shoveled to the rumbling pitcher covering the bag. vs. Burrell: ball, ball, foul back, and a home run smoked on a low arc to left field. Alarm bells. vs. Tejada: ball, swinging strike, tapper in front of the plate for Barajas to throw to Loney for the second out. vs. Brandon Belt: swinging strike, ball outside, ground foul wide of third, ball outside, soft foul toward the Giants’ dugout, hair’s breadth foul tip, foul back, looping liner to third base. Giants at Dodgers, 5 p.m. In the morning, Russell Martin singled in his first at-bat wearing pinstripes, later stole third and then scored the Yankees’ first run of 2011. In the early afternoon, I looked up and saw the Padres, whom most predict will fall back to also-ran status, going spike-to-spike with the Cardinals, 2-2 in the eighth inning, two runners on. As a bystander said, with the ESPN daytime coverage and the full-house crowd, it seemed like a playoff game. Down in the Dodger dugout, three hours before gametime, players in blue pregame shirts file in and out, sweating and hydrating even as their day has shifted into gear. This is a speculation-free zone. After six months of “what should we do, where will we finish,” it’s almost like an alarm waking up a groggy sleeper. These people are going to work. It’s all about the bottom line, a line that hasn’t been written. Baseball fans love their past and live for their team’s future. But Opening Day is the present: 0-0. We’re not living on borrowed time – we’re just living. It’s a fine thing. Here’s to a great day. Matt Kemp is trying to homer in his sixth straight game. Dodger clubhouse manager Mitch Poole gets his day in the sun, or more accurately, his day in the CNN. … for a beautiful Opening Day. We’re going to be game-threading it Cover It Live-style later this afternoon, so the chat should flow fast and freely. (I hope.) Stick around … I’m heading out to the ballpark in an hour or so. When the Giants are in the Dodgers’ rear-view mirror, they’re forgotten. When the Dodgers are in San Francisco’s rear-view mirror, Giants fans never seem to stop looking back. Obviously this comes with the disclaimer that not all fans of a team are the same, but you get the sense from up north that, for a great many people, the most important thing about the Giants winning the World Series is that the Dodgers didn’t. And I have to say, I just find it bizarre. In my four decades of personally watching the Dodgers win division titles, National League pennants and World Series, I can assure you that once the Giants were out of it, I never gave them a single thought, not when I was 6 or 10, not when I was 20 or 40. And yes, I certainly consider them the Dodgers’ No. 1 rival. But in Los Angeles, the winning alone has always brought complete satisfaction, and the Giants have nothing to do with it. Up north, strangely, either winning isn’t enough, unless the ones who are satisfied are having their voices drowned out. All winter long, I’ve seen taunts from Giant fans who, now that they’re finally having their day in the sun, can’t stop poking the guy in the next lounge chair instead of simply basking. A group of Giants fans has apparently put together more than $8,000 to fly a banner over Dodger Stadium during three games this week, including Opening Day, to taunt Dodger fans over San Francisco winning the World Series last year. My guess is, had the Dodgers won the World Series, no one would have thought the reverse was worth doing. That doesn’t mean that, as a Dodger fan, I’ve forgotten the past. The Miracle on Coogan’s Bluff, the Marichal-Roseboro incident, the near riots at Candlestick Park during that 1988 doubleheader (Chapter 50). Morgan at the end of ’82, Piazza at the end of ’93, Finley at the end of ’04. It doesn’t get more intense. And so, when the Giants and Dodgers meet Thursday for Opening Day, I completely expect the stands will be as friendly as two airline passengers fighting over the same overhead bin. But there should be a limit. 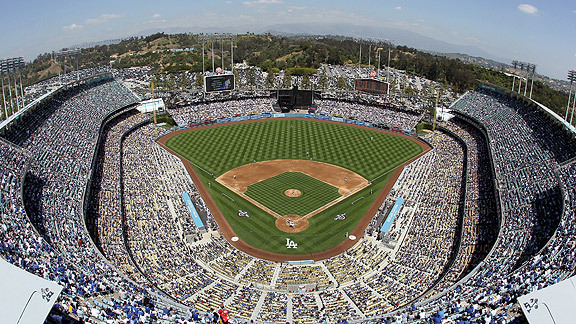 The rivalry is a big part of Dodger baseball, but it’s never been the biggest. I hope it stays that way. The Dodgers are winners, regardless of what’s going on in the short term of the franchise’s history, and I hope Dodger fans never let what’s going on with San Francisco become their barometer. John Lindsey and Jon Link have been designated for assignment – I think the expectation is that Lindsey, if not both Lindsey and Link, will clear waivers and possibly end up in Albuquerque. Most vulnerable to coming off the roster as the injured players return: De Jesus, Ellis, Cormier, McDougal and Paul. Pitching in Dodger Stadium for the first time, Rubby De La Rosa struck out four of the six batters he faced and went on to dazzle with two-hit, no-walk shutout ball over 5 2/3 innings with six strikeouts. Legendary hitter Ichiro was two of those strikeouts. Ivan DeJesus Jr. went 2 for 2. Jerry Sands (1 for 2) and Dee Gordon each made diving catches. Corey Smith completed his ridiculous spring with a three-run homer, leaving him 7 for 11 with four walks, two doubles and three home runs. Andre Ethier doubled in the game’s first run, and James Loney followed with a two-run single to give the Dodgers a 3-0 first-inning lead. Marcus Thames homered in the fourth. Randy Keisler, who came out of the Dodgers’ open tryout camp four weeks ago to get a minor-league contract, retired all four batters he faced, striking out two, including Ichiro. Allen Webster struck out the side in the ninth. As a team, the Dodgers faced only 29 batters and struck out 12. Steven Ames allowed an eighth-inning homer to Michael Saunders to spoil the Dodgers’ shutout. Aaron Miles hit into a double play and made an error on a foul pop-up. Andy LaRoche made the Oakland 25-man roster. Ned Colletti spoke to Steve Mason and John Ireland on ESPN 710 AM about Andre Ethier. “I don’t have any interest in moving him, trading him, anything,” Colletti said. Here are some ESPNLosAngeles.com and True Blue L.A. staff predictions on the Dodgers. I’m Scrooge. The Dodgers have officially unveiled their memorial patch for Duke Snider and set August 9 as the date they will honor his memory at Dodger Stadium. Tonight’s starting pitcher, Rubby De La Rosa, and Jerry Sands won the 2011 Jim and Dearie Mulvey Award, given to the top rookie in Dodger camp as voted on by the Dodger coaches. Clayton Kershaw will donate $100 per 2011 strikeout to a nonprofit organization fighting poverty in Africa, where his wife has been deeply involved in charitable efforts. 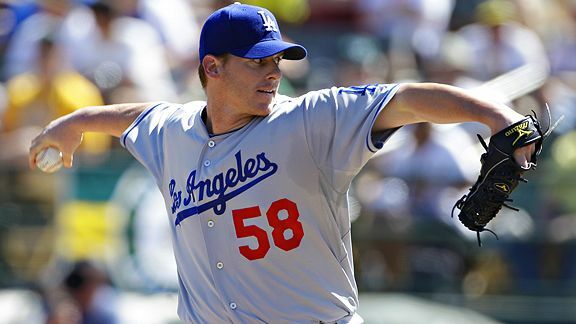 The LADodgerTalk interview series with Logan White concludes with Part 4. Lucas May, sent to Kansas City in last summer’s Scott Podsednik trade, was designated for assignment by the Royals. Jamie Moyer will spend his age 48 year as an ESPN “Baseball Tonight” analyst before trying to complete his comeback from Tommy John surgery next year at age 49. Cardboard Gods fought AT&T, and AT&T won — but so did Josh Wilker’s readers. Mariners at Dodgers, 7:10 p.m.
Dodger fans are going to have very little patience for games like tonight’s when the season starts. And they’ll come, as they always do. But if they come early and often, it’s going to get very ugly, very quickly. Rod Barajas hit his third homer in the third inning. Juan Uribe hit his team-high seventh double. Hiroki Kuroda picked off Torii Hunter, and walked none while striking out four in four innings. Michael Antonini, acquired in December for Chin-Lung Hu, pitched two shutout innings. Kuroda allowed three runs on seven hits. Scott Elbert gave up a two-run homer to Hunter in his only inning – he faced six batters and allowed four baserunners. Spotlight man Andre Ethier went 1 for 3. Adam Davis/Icon SMI Andre Ethier is the first Dodger to have three consecutive seasons with an adjusted OPS of at least 130 since Gary Sheffield and only the fifth in Los Angeles Dodger history to do so. Andre Ethier was asked today about his perplexing postgame comments from Monday, and here’s the explanation – as Tony Jackson of ESPNLosAngeles.com reports, he’s apparently afraid of being non-tendered after this season. The Dodgers went that route with former All-Star catcher Russell Martin over the winter, and Ethier hinted that a similar fate could be in store for him. “My salary is increasing each year,” Ethier said. “I would say the likeliness of me being here beyond this year, it’s not just my decision. … I have been kind of lucky to be in one spot in baseball for as long as I have been, for six years now. That is a long time to be in one city playing for one team. There is no inclination now other than to go out and play this year and see what we’ve got. But on the day the Dodgers finalized a three-year, $35 million contract extension for pitcher Chad Billingsley, Colletti did reveal that he had preliminary discussions during spring training with Nez Balelo, Ethier’s Los Angeles-based agent, on a possible extension for Ethier, but that those discussions died fairly quickly.Ethier insisted he was unaware that those talks had even begun between Colletti and Balelo, so he couldn’t have been aware that they had been quickly abandoned. Yes, he does appear to have a fair bit of disenchantment with the front office. What’s poetic is that Billingsley could have felt exactly the same insecurity a year ago, when Ethier, Matt Kemp and Jonathan Broxton got two-year contracts but he didn’t. There’s no doubt that a) the Dodgers aren’t going to pay $10 million or more to players they think can’t earn it, and b) Ethier is prone to melancholia and doomsday thinking. I think it’s one thing to motivate himself to have the best possible year, on and off the field, that he possibly can. It’s another thing for Ethier to think that the Dodgers aren’t interested in keeping him around – especially if he performs the way he is capable of. “Being a pitcher, it’s nice to have the security to fall back on in case something happens — because you only have so many throws in this arm,” Billingsley said. “But I’ve been fortunate not to have too many health issues, except for hamstring problems. Dodgers at Angels, 7:05 p.m.
Just 12 days after turning 23, Clayton Kershaw will be the fifth-youngest opening day starter for the Dodgers since moving to Los Angeles in 1958. He’s the youngest since Fernando Valenzuela in 1983. He’s also the first lefty since Valenzuela in 1988. Kershaw will be the Dodgers’ fifth different opening day starter in the past five years. It’s the first time in the last 90 years that the franchise has had five unique opening day starters in five seasons. Since 1900, no one has more strikeouts through his first four seasons than Tim Lincecum. 1) According to Elias, Lincecum became the first Giants pitcher to go at least 0-5 with an ERA of 7.80 or higher since Bud Black (0-6, 8.01 ERA) in September 1992. 2) Opponents hit .388 with runners on base off Lincecum in August. 3) Right-handed batters hit .362 in August against Lincecum. For the rest of the season, they hit just .210. 4) When you eliminate August, Lincecum was 16-5 with a 2.84 ERA in 2010. The Giants are looking to be just the fourth NL team to repeat as World Series champs, and the first since the 1975-76 Reds. The team finished with a 1.78 ERA in September, the fifth-lowest in a calendar month in the live ball era (since 1930). Opponents hit just .182 in September, the lowest since the Indians held opponents to a .174 average in May 1968. Don Mattingly makes his managerial debut. According to Elias, only four people have won an MVP and managed a team to a World Series title: Joe Torre, Mickey Cochrane, Frankie Frisch, Lou Boudreau. However, the latter three did so as player-managers. This will be the 10th time since 1958 that these teams have met on Opening Day. The Giants have won six of the previous nine. Though he had a reputation for overworking relievers, Joe Torre’s Dodgers were not generally among the top teams in using a pitcher on zero days rest. James Loney has 268 RBI over the past three seasons, but only 36 homers. Among the 43 players with 250 RBI since 2008, he has the fewest home runs. With Opening Day looming, here are some capsules on the Dodgers. Forgive me if, when I wrote them, I didn’t get the March 31 roster 100 percent correct. Gibbons is expected to begin the season on the 15-day disabled list because of lingering problems with the vision in his left eye, an issue Gibbons thought he had resolved when he returned two weeks ago from a visit to a San Francisco doctor who gave him a better-fitting contact lens. Gibbons said upon his return from that trip that his vision in his everyday life was dramatically better. But he said Monday that wasn’t the case in the batter’s box, because he couldn’t pick up the spin on breaking balls. Gibbons, who lives in the Los Angeles area, plans to see another doctor here on Tuesday — “about the fifth different guy I’ve gone to,” he said — in hopes of trying yet another contact lens. His original problem was that the lens kept popping out, the result of some flattening of his cornea that is a normal result of the PRK (photorefractive keratectomy) surgery he underwent last fall as a follow-up to the lasik procedure he had in 2004. OK, it’s not a total tragedy: Gibbons’ $650,000 salary for 2011 became guaranteed Monday. And when a door closes for one guy, it opens for someone else. But you’d still like to see a player go down swinging, instead of not seeing. It was hardly surprising — Chavez had a terrific spring, outhitting everyone on the team for average, even the red-hot Alex Rodriguez, and showed he could still play an excellent third base and a serviceable first base — but certainly inspiring for a player hampered by multiple back and shoulder injuries over the past five seasons, and potentially a steal for the Yankees, who waited as long as possible to be sure Chavez would make it through camp in one piece. Up in Oakland, Andy LaRoche is still waiting to hear if he grabbed a spot with the A’s. LaRoche had a .987 OPS and team-high four homers this spring, playing four infield positions. In Arizona, Tony Abreu has reportedly been placed on waivers. Pittsburgh’s James McDonald, who has thrown only 6 2/3 innings this spring, might miss the start of the season with a left side injury. Local/national reaction: Significant uproar over Ramirez stating the obvious. 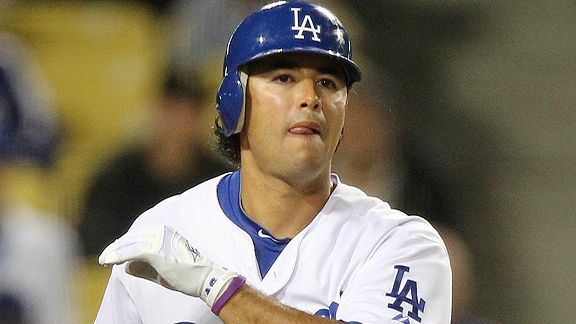 Ethier is in the final season of a two-year, $15.25 million contract that will pay him $9.25 million this season. And the way he’s talking, the Dodgers might have a difficult time re-signing him next winter because of the uncertainty of the team’s payroll and subsequent ownership in the wake of owner Frank McCourt’s divorce from wife Jamie. OK, first of all, unless everything I’ve ever seen and calculated about him is false, Ethier can’t become a free agent until after the 2012 season. So there’s no issue with regard to the Dodgers’ ability to sign him for next season other than the possibility of having to go to an arbitration hearing, which they narrowly avoided the last time around. Beyond that, why is Ethier talking about leaving now? It was one thing when Ramirez did it, because everyone with a brain knew that, short of a massive season, he wasn’t coming back to Los Angeles in 2011 after being suspended for 50 games in 2009. If Jonathan Broxton had said what Ethier said, it would be pretty disturbing (at least among those who aren’t aching for him to be gone), but at least you’d know where it was coming from. Are we to believe that Ethier is so discombobulated by the McCourt divorce that he’s plotting his exit from Los Angeles 19 months before he has the ability to engineer it? I’m wondering if somehow, something got lost in the translation, but otherwise, I think the most tranquil Dodger Spring Training in years might have just had its first rock thrown through the glass. Justin Verlander signed a contract extension with the Tigers on Wednesday that amounts to $80 million over five years. Verlander had an off year in 2008, but came back with his best season ever. His off year was arguably worse or at least little better than Billingsley’s off year in 2009. Billingsley outperformed Verlander two years running in adjusted ERA, though he didn’t pitch as many innings. The best season either pitcher had before last year was Billingsley’s 2008. And again, Billingsley is more than a year younger. Before the 2009 season, it’s hard to see how anyone would have valued Verlander much more than Billingsley. It’s not as if Verlander had any postseason success to make up for his 2008 problems. Billinglsey didn’t have a 2010 to match Verlander’s 2009, but he did pitch well enough to earn a multiyear contract extension that means he will earns $40-odd million over the next four years. Dave Cameron of Fangraphs thinks the Dodgers got a bargain, and maybe that’s so – the career adjusted ERAs of the two pitchers are nearly identical now – but the dollars take into account that both Billingsley’s 2009-10 seasons didn’t live up to 2008. Billingsley gets a whole mess of security, and the Dodgers get a pitcher that should be good, maybe even great. Both sides have reason to be happy. Rafael Furcal singled, walked and scored two runs. Consecutive RBI hits by Juan Uribe and Rod Barajas rallied the Dodgers from a 3-2 sixth-inning deficit. Jerry Sands and Hector Gimenez each had late hits. Relievers Mike MacDougal, Matt Guerrier and Hong-Chih Kuo pitched 3 1/3 combined shutout innings, allowing one hit and striking out three. Ted Lilly walked five and allowed four hits in a four-inning outing. Kenley Jansen walked three more and gave up a hit and a run while recording only two outs. Ivan De Jesus Jr. messed up a double-play ball behind Jonathan Broxton with the Dodgers leading 4-3 in the ninth. After the tying run scored on a single by top prospect Mike Trout, Broxton walked minor-leaguer Andrew Romine, allowing Hank Conger to come up to bat and hit a sacrifice fly. Gabe Kapler hit into a game-ending double play with two on in the bottom of the ninth. I’m seriously considering complete abstention from debating the merits of Jonathan Broxton for the time being. The season hasn’t even started, and already the fur is flying about his value. No, he didn’t do his job. Neither did De Jesus, Jansen or Lilly, but no one will question their manhood. I’m willing to admit I’m concerned about whether Broxton’s all the way back from his late 2010 troubles, but I just don’t know if I can spend yet another year arguing about the man’s courage, spine or gumption. It’s completely subjective, and people are just going to believe what they want to believe. It seems Jay Gibbons might go on the disabled list because his eye issues remain unresolved. That would probably mean an Opening Day start for Tony Gwynn Jr. As for the roster spot, that could go to anyone: a pitcher (allowing Scott Elbert and Lance Cormier both to make the team), a catcher (allowing both Hector Gimenez and A.J. Ellis to make the team), an infielder (Juan Castro) or an outfielder (Kapler or Trent Oeltjen). “Don’t Stop Believin'” is back? Goodness gracious sakes alive, why?? ?